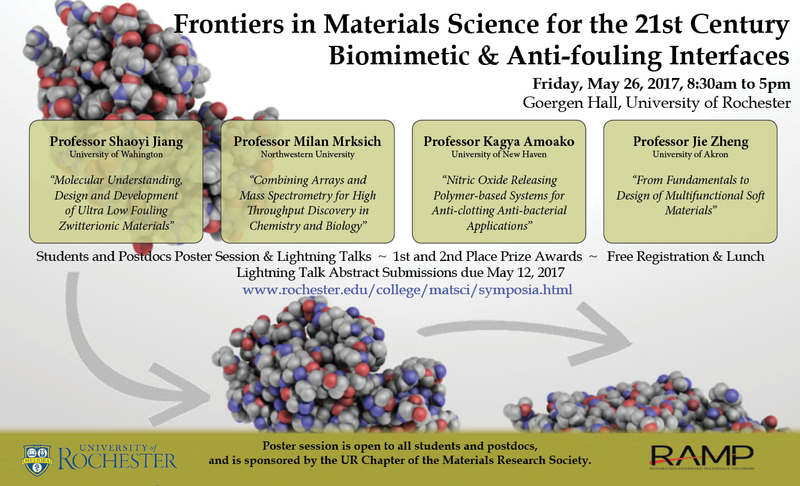 The Rochester Advanced Materials Science Program will sponsor the Frontiers in Materials Science for the 21st Century Symposium from 8:30 a.m. to 5 p.m. Friday, May 26, in Goergen Hall’s Sloan Auditorium. The topic is “Biomimetic and Anti-Fouling Interfaces,” and there will be four keynote speakers, a poster session, and lightning talks. More information about the keynotes is available on the program website. Registration for the event, free and open to the public, is recommended, and can be completed by selecting the link on the symposium website. Graduate students and postdocs are encouraged to sign up for the poster session and lightning talks when registering. Contact gina.eagan@rochester.edu for further details.